HNEC head Emad Sayeh announces the extension of the voter registration period to 15 February (Photo: HNEC). Libya’s High National Election Commission (HNEC) announced today that it was extending voter registration until 15 February. The announcement was made by HNEC head Emad Al Sayeh in a press conference. 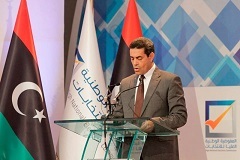 Sayeh also confirmed that overseas voter registration for Libyans abroad will commence on 6 February. No official date for the elections has been announced as of yet and the House of Representatives has yet to pass an election law, needed to enable the elections to take part. Libyan elections in 2018 are part of the Action Plan proposed by UNSMIL head Ghassan Salame at the end of 2017 and approved by the UN Security Council.